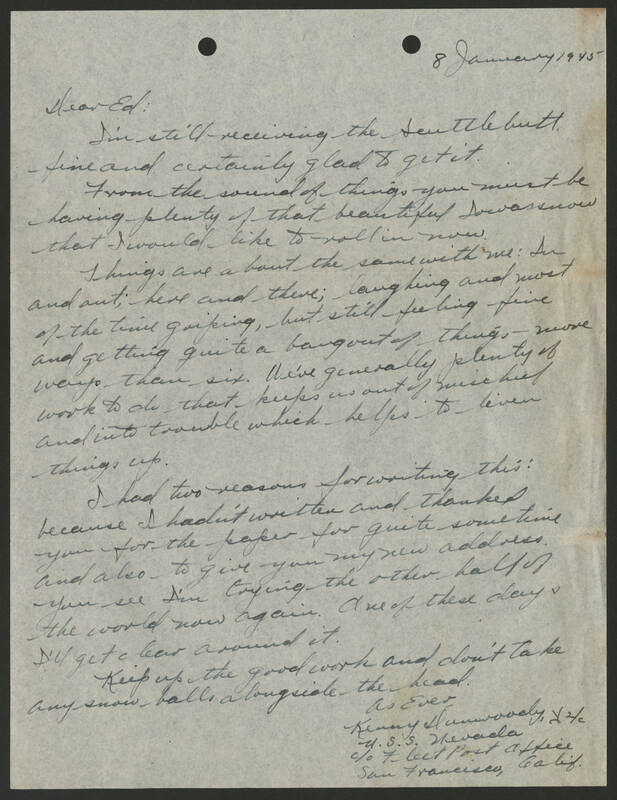 8 January 1945 Dear Ed: I'm still receiving the Scuttlebutt fine and certainly glad to get it. From the sound of things you must be having plenty of that beautiful Iowa snow that I would like to roll in now. Things are about the same with me. In and out; here and there; laughing and most of the time griping, but still feeling fine and getting quite a bang out of things -- more ways than six. We've generally plenty of work to do that keeps us out of mischief and into trouble which helps to liven things up. I had two reasons for writing this: because I hadn't written and thanked you for the paper for quite sometime and also to give you my new address. You see I'm trying the other half of the world now again. One of these days I'll get clear around it. Keep up the good work and don't take any snow balls alongside the head. As Ever, Kenny Dunwoody Y2/c U.S.S. Nevada c/o Fleet Post Office San Francisco, Calif.